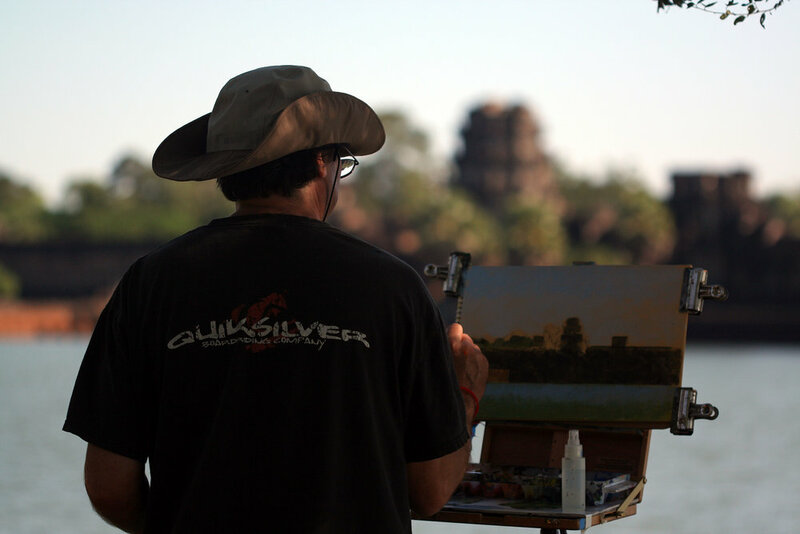 James Warren Perry painting at the Temple of Angkor Wat, Cambodia. Mr. Perry was born in Greenbrae, California in 1958. After attending the University of the Pacific, Stockton, CA, he graduated, BFA with distinction, from California College of Arts and Crafts, 1980. The artist’s work has been featured in over 100 exhibitions. Institutions that have exhibited Mr. Perry’s work include: Riverside Art Museum, Riverside, CA; Palm Springs Desert Museum, Palm Springs, CA; Museum of Art, Kochi, Japan; Masur Museum of Art, Monroe, LA; Attleboro Arts Museum, Attleboro, MA; Texas Artists Museum, Port Arthur, TX; Art Museum of Los Gatos, Los Gatos, CA; California Museum of Art, Santa Rosa, CA; Museum of the Southwest, Midland, TX; United States Embassy, Reykjavik, Iceland; California College of Arts and Crafts; Oakland, CA; Stanford University, Palo Alto, CA; Hewlett Packard Corporate Head-quarters, Palo Alto, CA and the State of California Attorney General’s Building, Sacramento, CA. Download an abbreviated artist’s biography. Mr. Perry is the recipient of a full fellowship from the Vermont Studio Center and a Marin Arts Council Individual Artist’s Grant. His artwork has been featured in numerous publications, including New American Paintings, American Artist; Artweek and exhibition catalogs from Museum of Art, Kochi, Japan; Art Museum of Los Gatos; The Riverside Art Museum and the United States Embassy, Reykjavic, Iceland. Hundreds of his paintings are in private, public and corporate collections across the United States, including over 30 commissioned works for private and corporate clients. 1. Debra Koppman, “Previews, Transcendence: The Landscape Paintings of James Warren Perry,” Artweek (Dec. 2002/Jan. 2003).